Forget the store-bought gummy bears. 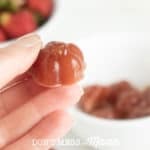 Make your own Homemade Healthy Fruit Snacks with this easy recipe that your kids will love. 1/2 cup frozen fruit mango, berries, etc. In a sauce pan, heat orange juice, frozen fruit, and raw honey or maple syrup on low heat. When liquid is hot, add gelatin one tablespoon at a time and use an immersion blender so that gelatin is well-absorbed (no lumps). The consistency will thicken. Pour into silicone molds and refrigerate until the snacks harden - about for 3-4 hours. When ready, pop out of the molds. They should come out pretty easily. (Pop them in the freezer for a few minutes if they gummy snacks don’t come out easily).